Companies that match contributions to your retirement plans can make a difference of hundreds of thousands of dollars when it’s time for you to retire. Consider this simple, eye-opening example from The Truth About Retirement Plans and IRAs. Do You Need to Find a New Job? If your employer doesn’t offer matching contributions, I encourage you to find a job with an employer that does. According to Charles Schwab, 73% of employers that offer a retirement plan match employee contributions, so there’s really no reason to work for an organization that doesn’t. This matters a lot. Consider this simple example: Say you contribute $5,000 per year for 40 years, earning 8% annually. You’ll accumulate $1,295,283 by retirement. And if your employer adds 3% to your account yearly, the value of your account will be nearly $400,000 more! Indeed, working at a job that doesn’t provide a match could cost you hundreds of thousands of dollars. Are you sure that working at your matchless job is worth it, considering that thousands of other employers are willing to give you a match? Too often, people think only about salary when considering a place of employment. It’s important that you keep in mind noncash compensation as well — not only matching contributions to a retirement plan but also paid time off, health insurance and other benefits. According to PayScale.com, noncash comp is worth up to 60% of base pay. If you’re not receiving these benefits, you’re giving away massive amounts of money. You can fix that problem by choosing to work for an employer that provides a competitive salary and benefits. From the #1 independent financial advisor in America, ranked three times by Barron’s: a guide to making the most of your retirement plans and assuring long-term financial security. 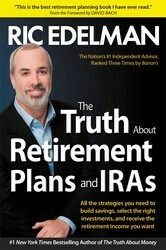 Ric Edelman, a New York Times bestselling author, has been providing financial advice to the public for more than twenty-five years and is a well-known, successful financial advisor. His television series, The Truth About Money with Ric Edelman, airs on Public Television stations across the country and his syndicated radio program can be heard from coast to coast. Ric’s bestselling books include The Truth About Money; Ordinary People, Extraordinary Wealth; and The New Rules of Money. His firm, Edelman Financial Services LLC, serves individuals and families across America. Visit Ric online at RicEdelman.com.